A caldera eruption is a massively violent thing. We’re not talking the quiet calderas in shield volcanoes like Mauna Loa and Kilauea, which love erupting and frequently pour burning hot stuff all over the landscape, but generally stick to easygoing lava flows that allow people to get out of the way. We’re not even talking about Fernandina Island, which had a caldera collapse in 1968 and is too dangerous for Galapagos-goers to visit. No, we’re talking about the kinds of eruptions that happen fast, big and explosively. We’re talking about the kinds of eruptions that hurl ash and pumice so high and so far that the landscape for hundreds or thousands of miles around is blanketed in thick, choking ash. We’re talking about eruptions that bury landscapes for hundreds of square miles in pumice fields tens of feet thick. We’re talking about the kind of eruption whose traces are still fresh and clear more than seven thousand years later. It’s hard to wrap your mind around this, but here we are: over thirty miles from Mount Mazama as the crow flies. Only now have we come near the northern boundary of the pumice fields, and they are still between six and eight feet thick. Perspective time. I’m standing in a place where, if I’d been able to stand still during the fallout from the eruption, I’d have been over my head in pumice. Over thirty miles away, not in the path of any lahars or pyroclastic flows or any such excitements, and if I’d had a one-story house, it would have been buried to the eaves. 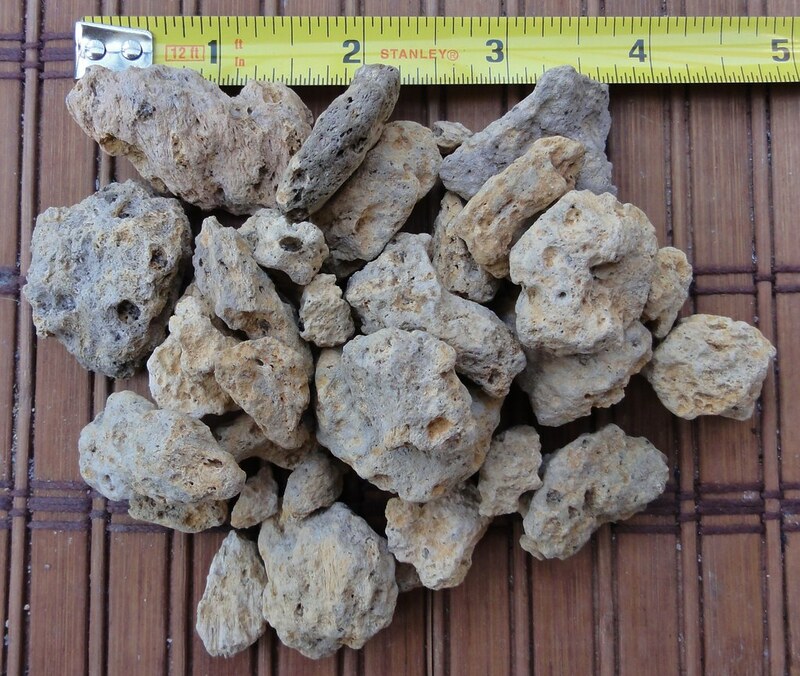 And, people, these aren’t itty-bitty bits of pumice. Stuff landing here reached up to nearly two inches long. Now, pumice is light, I grant you that. But it’s not exactly aerodynamic. Toss it up in the air, and it doesn’t take very long to come back down. So just imagine the force needed to hurl one and two inch chunks of it over thirty miles to land in blankets that would have buried even basketball players standing on their tip-toes. It’s difficult to imagine. We just haven’t had many events like that in our living memory. In fact, when my intrepid companion and I got to talking about caldera eruptions the other day, I had to ask Erik Klemetti when the last one was. Mount Pinatubo fits the bill: maclargehuge eruption with worldwide consequences that left a caldera nearly two miles across. Note that Erik called that a “small” caldera collapse! It’s the closest to Mount Mazama we’ve come in the information age. In the background, there are mountains, yes. In the foreground, flat or gently-rolling land. When Mount Mazama spewed its guts all over the landscape, it filled in valleys and leveled things out. 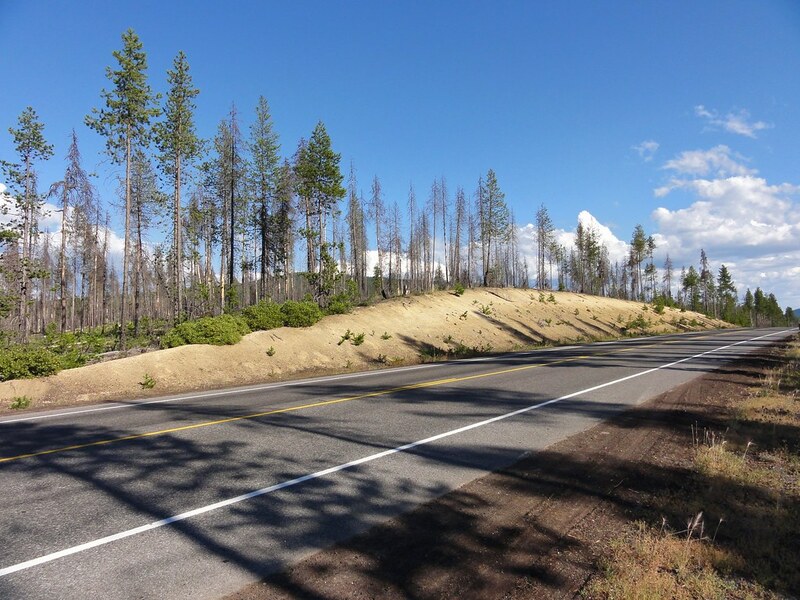 The pumice-filled ash doesn’t hold moisture well, so the scrappy Ponderosas, already in the rain shadow of the Cascades, are even more starved for water. This isn’t a land that supports riots of vegetation. The only things that survive here are those used to doing without. 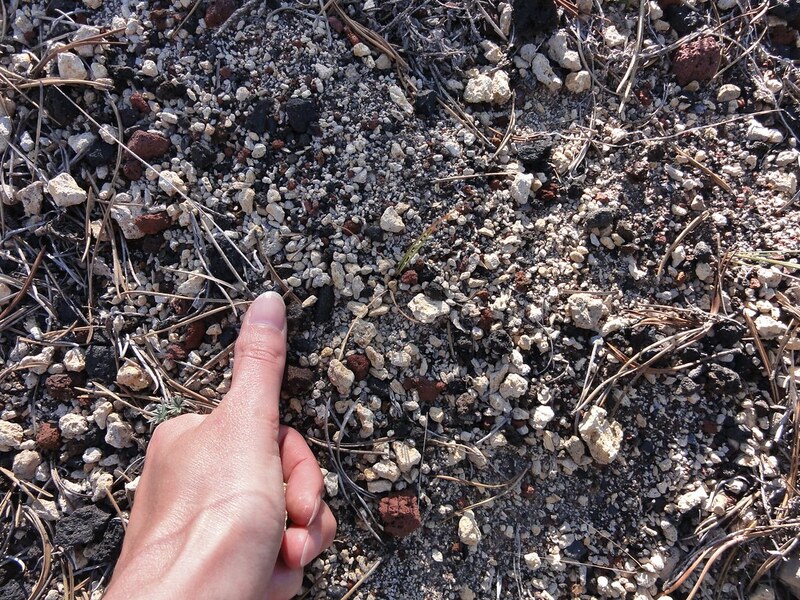 Mount Mazama Pumice mixed with cinders. I should get a centimeter scale tattooed on my thumb, shouldn’t I? Close to the road, you’ll notice all these lovely red and black bits mixed in with the yellow-white pumice. Those are cinders, trucked in and scattered on the road for traction on snowy winter days. 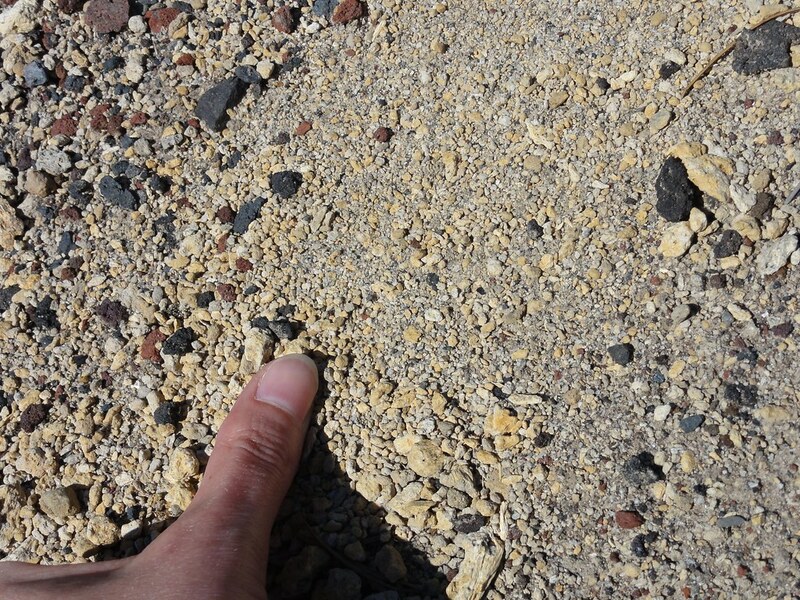 I have to admit something to you: my heart did a little bound of joy, because that’s what the roadsides in Flagstaff look like (usually minus the large pieces of pumice, but not always – we’ve got a stratovolcano that liked coating the area in pyroclastics, too). Things weren’t so colorful before people came along and started spreading cinders on the roads. Just tough green plants, tan ash, and pale pumice as far as the eye could see. l hill, not much taller than I am, but a hell of a climb in all that loose stuff. Little clouds of ash puffed up and coated my shoes. Moisture seemed sucked instantly from my skin. It smelled of volcanic earth and pine resin, and if you’ve never smelled that before, you’re in for a treat. It’s one of the most beautiful scents on earth. And as you stand there, you ponder the force it takes to create a landscape like this, and your poor brain boggles. Thing is, this is only the beginning. By journey’s end, you may just feel you’ve experienced a caldera eruption inside your own skull. Lockwood DeWitt: Tour guide of Oregon geology extraordinaire, and without whom I wouldn’t have known what the hell I was seeing.